Eze Ahanonu was first introduced to engineering in middle school, when he attended Summer Engineering Academy at the University of Arizona. Somewhere in between designing aerodynamic car bodies in SolidWorks, 3D printing them, and testing them in a miniature wind tunnel, he realized he wanted to pursue a degree in engineering. But it wasn't until his senior year at the UA that he realized he wanted to go to graduate school. "The moment I was accepted was extremely exciting," Ahanonu said. "I never expected I would be chosen to receive an opportunity like this." Hispanics, African-Americans and American Indian/Alaska Natives made up 32.4 percent of the U.S. population in the 2016 census prediction, but they made up 12.7 percent of U.S. citizens who received science and engineering doctorates, according to data from the NSF. The Bridge to the Doctorate program aims to bridge that gap among U.S. citizens and residents. The program combines financial assistance with opportunities for professional development, such as coaching on scientific writing and assistance with applications for federal fellowships. 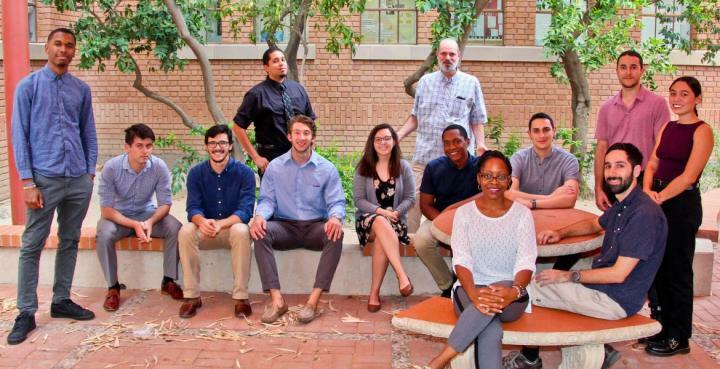 There also is a welcoming atmosphere in which faculty members and students go on field trips to local attractions, such as the Arizona-Sonora Desert Museum, and a community service element that gives students a link between the science they're working on and opportunities to help others. A teaching and research environment that sets an example of diversity among scientists has bred success. Three of Field's four co-investigators are underrepresented minorities, as are half of the 18 faculty members advising the students. All of the 13 students in the 2012-14 cohort completed their master's degrees. Four went on to land jobs in STEM fields, and the other nine entered STEM doctoral programs – one at Stanford University and the rest at the UA. Four members of the current 2016-18 cohort, of which Ahanonu is a part, have submitted or published journal publications or conference papers. "Not having to work and not having funding with lots of strings attached allowed me to focus solely on school and to pursue research that truly interested me," said Amanda Wilson, an environmental health sciences doctoral student who has presented research at seven conferences and authored or co-authored six papers. "I also enjoy the collaborative and creative thinking that occurs when you bring so many perspectives and bodies of knowledge together." The NSF award comes on the heels of the UA's recent designation as a Hispanic-Serving Institution. "The Bridge to the Doctorate program is an incredible resource for underserved students and I am so thrilled that it will be able to accept even more students thanks to this new grant from the National Science Foundation," said UA President Robert C. Robbins. "We have an increasingly diverse student body and it is so important that we create the environment they need to succeed in their chosen paths. By giving them the ability to focus on learning and on developing their potential, this program not only creates opportunities for our students but ultimately furthers the UA's positive impact in our region and globally." Field has a history of working with underrepresented minorities from Latin America through the U.S.-Mexico Binational Center for Environmental Sciences and Toxicology, and from organizing conferences about sustainable mining for graduate students in Mexico, Peru and Brazil. "I got my Ph.D. overseas, so I know what it's like to be a foreigner somewhere else," he said, adding that one of the most rewarding moments came when the project's organizers asked fellowship recipients whether they felt comfortable as UA graduate students. "All of them came back with the answer that they felt really welcome in their home departments. That shows how accepting the culture is here at the UA, and I was very pleased with that result." Maryam Tanbal, an incoming optical sciences doctoral student, said the Bridge to the Doctorate project caters exactly to her needs. "I started off as a master's student unsure if I would be capable of pursuing a Ph.D.," she said. "When I found out I received the fellowship, I was humbled by the immediate academic support and encouragement to continue my education. The Bridge to the Doctorate Fellowship ignited and propelled my desire to apply to the Ph.D. program."